Vadim's recipes for Pork Rillettes, Bacon-y Meatloaf, Kielbasa, Confit Chicken Thighs, Roast Beef, Grilled Hearts, Braised Lamb Shank, Breakfast Sausage, Pate de Campagne, and Brined Pork Chops. 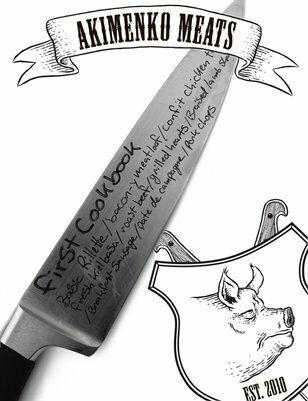 In this first issue of the Akimenko Meats Cookbook we explore some delicious recipes and classic preparation techniques. The purpose of the magazine is to promote Akimenko Meats, a butcher shop which is opening Winter 2010 in Cambridge Massachusetts, and stimulate interest in some great techniques in meat preparation and cooking. Check it out!